I believe it's quite common, when children are growing up, for them to have an image in their minds of what they'll be when they grow up. I know I did. It changed often as I got older. But the one that was the strongest, the oldest and I remember most clearly is of me in glasses and a suit. Now I know why the suit was there, my father wore a suit every day, classic father daughter stuff there. I'm not so sure where the glasses came from. I do know that from an early age I associated wearing glasses with being brainy and also with authority figures. This image of me dates back to around 7 or 8 years old. Of course as I got older the image changed as I rebelled and my image of my future self became more arty and bohemian. At university I studies arts, majoring in philosophy, but taking just as many papers in art history. But you can't fight some things and I also took management. Lets now skip forward and see what my vision is now. Amazingly, its that early vision of me which is most representative to the outside world. Four days a week (dress down Fridays people) you'll see me in suits or other smart business attire and of course glasses. That was until yesterday. I started wearing glasses when I was 14 and was getting terrible headaches sitting in the back row of the maths class. For many years (and luckily for me) I only had to wear them for reading and school work. I say luckily because it was the early 90s and television screen glasses were all the rage. Fortunately not very many photos exist of these initial fashion atrocities. Because I didn't really have to wear them that often they didn't really impact on my life that much. When I got to university the glasses were getting smaller, but I was wearing them for longer. I could still go out without them, most importantly, but I was wearing them most of the rest of the time. By the time university was over and I was living in London I couldn't go out without them at all. Don't get me wrong, I always liked wearing glasses, it seemed right and I guess, in a way, they were something I could hide behind. The thing is, they change how you perceive the world. You are always seeing it through a layer of plastic (or glass), usually with tiny scratches and imperfections, finger prints or drops of water. Your connection with those around you is less immediate. I'm a very visual person and have be blessed to see some beautiful breath-taking things, but most of these have been through a layer of plastic. Yesterday all that changed. When my lovely husband initially raised the idea of laser eye surgery I was completely against it. I liked wearing glasses, they made me look intelligent, they hide the wrinkles under my eyes, they were part of my identity. Most importantly I'm terrified of things near my eyes. The idea of something cutting my eye makes my skin crawl. However he was persistent. And I got a new pair of glasses with transitions lenses. These glasses were a complete nightmare. They cost a fortune, they poked Pete in the face when we hugged or kissed, I couldn't lie on my side with them on as they dug in, they went stupidly dark on foggy or overcast days and they ripped my hair out when I took them off. Basically, they pushed me over the edge. I begrudgingly went for an assessment and was given the good news I could have the procedure if I wanted. At this stage I was quickly coming round to the idea. Unfortunately I we couldn't afford it at the time. So time went on and my hatred for my glasses became a deep loathing. More discussions about the surgery were had. The pros were weighed against the considerable con (the cost) and it was decided that rather than get another pair of glasses I should get my eyes done. So it was booked and yesterday I went in for the final assessment at 10am. This was really nerve wracking for me. I knew it was possible (highly unlikely) for the surgeon to say I wasn't a suitable candidate and I'd built my hopes up so high I didn't know how I'd handle such an eventuality. Of course I was just being melodramatic and nothing of the sort happened. Off home I went knowing the at 3:30pm I'd be taking some pills at the eye surgery ready to be lasered. And so I was. I biked there because it was a gorgeous sunny day and I knew I probably wouldn't be doing much riding over the coming days. After paying I took a couple of pain killers, a sedative and had anaesthetic drops put in my eyes and sat in the comfy chair (not the comfy chair!) reading Spoke and chilling out. Sedatives are good. 15 minutes later I was lead into the room with the laser, I lay down. 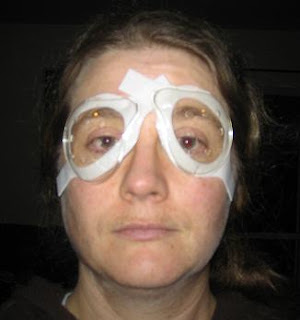 One eye was covered with gauze and the other had the speculum put on. There's no way around it, this is pretty damn horrid. It hurt a bit and was really really uncomfortable. Then they make the flap by pushing a suction ring against the eye. At this stage I couldn't really see anything, everything was just a grey blur. It was also really uncomfortable and stung a bit when they made the flap. Once that was done I could just make out the green light I had to look at and then I could smell the burnt hair smell of my eye being lasered. It took seconds, and if it wasn't for the smell I wouldn't have even known it was happening. Then the flap was brushed back into place and the horrible speculum was removed. It took maybe a minute in total. Then it was the same for the other eye, except I knew exactly what was coming so it didn't seem so bad. After another minute I was lead to another comfy chair in a darkened room and after 15 minutes the surgeon checked my eye and the evil eye shields were put on and I was whisked home by my lovely husband. ........everything is clear. I can see things across the room. I can walk in the rain with my head held up. Which is great, because I love walking in the rain and its just sucked so bad for the last ten years that I haven't been able to fully enjoy the experience. I can go night riding without lens flare. I can buy sun glasses. I can kiss my husband and not poke his eye out. But most importantly I can see the world directly, no plastic barrier between me and the beauty and wonder that's all around me. Sure I've had to give up my way of hiding, but I'm an adult and it's part of growing up (and there's always botox!! kidding). This is part of the new me that's been evolving over the past 3 years. And now this new me can see everything! (Disappointingly this new me can't actually shoot lasers out of her eyes now, but I guess I can't have everything). PS, Here's a couple of shots with the shields and the teeny dots left today.